Disclaimer: BRAVO is not a pharmaceutical, medical or therapeutical product. BRAVO is a complex mixture of microorganisms and other ingredients available on the international nutritional markets without medical prescription. We do not offer nor give any medical or nutritional consultancy services. Refer to your doctor, dietician or nutritionist should you need advice in this fields. Unless otherwise agreed in writing by SILVER SPRING Sagl, Mendrisio (CH) (hereafter the “Seller”), the following are the Terms and Conditions of Sale of the Seller which, together with any other terms and conditions agreed upon in writing between the Seller and the customer (hereafter the “Purchaser”), shall apply to all sales of goods, services and support by the Seller to the Purchaser. Through the use of the website www.bravo-europe.com, namely in case of placement of purchase orders, the Purchaser declares and agrees to accept and be bound by the present Terms and Conditions of Sale. The Seller reserves the right to modify these Terms and Conditions of Sale from time to time without notice. It is therefore the Purchaser’s duty to verify, before using the website and/or the online shop, the content of these Terms and Conditions of Sale. Any order shall not be binding upon the Seller until the related written confirmation of order, which shall be dispatched by the Seller either by post, courier, telefax or electronic means (for example e-mail), has been received by the Purchaser. Orders must be submitted in writing, stating the preferred shipment address, delivery dates, quantities and detailed description of the requested products. Orders may be placed either by post, courier telefax, e-mail or other electronic means of communications (for example through our website) which allow the transmission of orders in written form. Should the confirmation of order differ from the order, the Purchaser shall communicate in writing the discrepancy and its disagreement on the proposed terms within 5 working days from receipt of the confirmation of order. In the absence of any such communication, the Purchaser shall be deemed to have accepted the sale’s terms and conditions as set in the confirmation of order. In case of significant discrepancy between the confirmation of order and the order with reference to material aspects of the transaction (namely: price and quantity of the product), the Seller shall request a written confirmation of acceptance by the Purchaser. In case of non acceptance, the contract shall be considered as never concluded. The customer may request a written pricing quotation for the supply of products, which shall remain valid and binding upon the Seller for 5 working days, unless otherwise indicated in the quotation itself. In all events, the price and other economic conditions as stated in the confirmation of order issued by the Seller shall be considered as accepted and binding upon the parties. The Seller reserves the right to correct pricing errors prior to shipment, subject to the Purchaser’s right to cancel the order. Prices and other economic conditions (discounts, rebates etc.) published online or through any other advertising or commercial communications to the general public are not binding upon the Seller and subject to modification at any time and without notice. Such communications may not be interpreted as representing an offer by the Seller to conclude contracts upon the indicated terms. Except otherwise stated in the written confirmation of order, all prices are exclusive of transportation, insurance costs, value added tax or any other applicable tax, duty, levy or charge in any jurisdiction and the amount of any taxes which the Seller may be required to pay in advance or collect shall be for Purchaser’s account and shall be added to each invoice issued by the Seller as separate items. Any cost, expense, tax, duty, levy or charge referable to the transaction which has not been included in the invoice may be invoiced later on by the Seller. The Purchaser shall pay on the terms stated in the confirmation of order. In principle, the Purchaser is requested to make a full payment through Paypal or credit cards or bank transfer before shipment. Failing any request or indication, payment shall occur net without discount within 30 days from the date of the confirmation of order. The Seller reserves the right to suspend any delivery (including future or partial deliveries), or require a satisfactory guarantee, in the event the Purchaser fails to pay in full and / or on a timely manner any order (including partial deliveries). In case of violation of the agreed terms and conditions of payment by the Purchaser, the Seller shall be entitled to charge and recover from the Purchaser a default interest in the rate of 7% per year on all overdue amounts. The Purchaser shall pay the amounts due in Swiss Francs, without being entitled to set-off. The Seller’s obligations shall be fulfilled at the Seller’s Swiss company premises in Via Pian Scairolo 11, 6915 Pambio-Noranco (Switzerland) (hereafter “Place of Delivery”). The Seller shall deliver the goods to the Purchaser or to its representatives or auxiliaries (namely, the transportation company or courier or the post) at the date stated on the confirmation of order. Failing such indication, the products may be delivered at any time as the Seller deems appropriate, being understood that the date and time of delivery must be communicated to the Purchaser with a prior notice of at least 5 working days in case of personal receipt. Any delivery dates indicated by the Seller are non-binding and based on the conditions prevailing at the time the order is placed and under the assumption of normal supply and manufacturing conditions. In no event the Seller shall be liable for any damages to the Purchaser or other persons due to delay in delivery or non-delivery. Except in case of termination by the Purchaser in accordance with the present Terms and Conditions, delay in delivery shall not relieve Purchaser of its obligation to accept delivery thereof and pay for the products. If a purchase order is not executed within 30 days from the date of receipt of the confirmation of order, the Purchaser shall be entitled to terminate the contract and obtain full reimbursement of the price paid. Reimbursement shall take place within 10 working days from the date of receipt by the Seller of the termination notice. An order is deemed to be executed by the Seller when delivery is offered at the Place of Delivery in accordance with the contract. All transportation or shipping shall be at Purchaser’s costs and expenses. The Seller reserves the right to ship products freight collect and to determine the means of transportation and routing on the Purchaser’s behalf and for his/her account. The Seller may (without being obliged to) insure the full commercial value of the products or declare the same to the transportation company or courier or post at the time of shipment. All freight and insurance costs shall be for the Purchaser’s account, who / which agrees to assume / reimburse them in full. The risks of loss and damage shall pass to the Purchaser on the delivery date at the Place of Delivery. In case of shipment, the risks shall pass to the Purchaser upon hand-over by the Seller of the products to the transportation company or courier or post. Confiscation, seizure, block or destruction of, or damage to products shall not release, reduce or in any way affect the liability and / or obligations of the Purchaser therefore. In particular, before placing an order, the Purchaser shall be responsible to verify that the products may be imported and consumed in his/her/its Country of Residency having regard to any applicable foreign or domestic laws. Title and property shall pass to the Purchaser upon delivery, provided that the invoiced amounts have been paid. Insofar payment has not been received, the Seller may, at anytime, register its title of property into the Register of reservation of property. In case of personal receipt by the Purchaser (or its representatives) at the Place if Delivery At the time of delivery, the Purchaser (or its representatives) shall execute an accurate inspection of the products. In the presence of defective products or a non-conform delivery for any reason whatsoever, the Purchaser shall issue immediately a notice of defect or non-conformity, which must state in sufficient detail the nature of the deficiencies. In the absence of a valid and timely notice of defect or non-conformity, the delivery shall be considered as accepted. In case of shipment The transportation risks of damage to the products are borne entirely by the Purchaser. Should the packet be visibly damaged, the packet may be opened only after consultation and in agreement with the Seller. The Purchaser shall address immediately upon receipt to the transportation company a notice of damage and obtain from the same a certificate of damage. The Purchaser shall notify without delay to the Seller copy of the notice of damage and of the certificate of damage. In any case, the Purchaser shall keep until expiry of the guarantee the packet in the original conditions, so as to be able to show it in relation to a claim of guarantee if so requested by the Seller. The violation by the Purchaser of the above mentioned obligations shall determine the caducity / invalidity of the guarantee on the products and any related rights, except in the case that the Purchaser is able to prove that the alleged defect and / or damage is imputable to the Seller and not to a defective transportation or shipment. The Products shall be deemed accepted by the Purchaser, unless a written notice of defect or non-conformity, which must state in sufficient detail the nature of the deficiencies, is notified to the Seller within 10 working days after receipt. Claims concerning defects that could not be discovered by receipt despite accurate inspection of the goods must be made in writing and received by the Seller within 10 working days from discovery of the defects but in no event later than 10 working days since the expiry of the guarantee. Common rules Any guarantees for defects expires on the shelf life date as indicated on the products, but at latest 2 calendar years from delivery at the Place of Delivery. In case of defective products, the Seller shall, at its discretional option, either (i) replace or (ii) repair at its own costs the defective products or (iii) fully refund the amounts paid by the Purchaser. The Seller shall also reimburse the transportation or shipment costs paid by the Purchaser for returning the goods up to a maximum amount of CHF 100.-. Any other remedy or right to compensation is excluded. For the sake of clarity, with the exception of personal injury, the Purchaser shall have no further rights to compensation or any other rights of any kind in case the Seller has fully and timely remedied to the reported defect by exercising one (or more) of the above options. Before returning a product for repair or replacement (as the case may be), the Purchaser shall request a written authorisation by the Seller or by its authorised representatives, which shall contain detailed instructions as to how and where the products must be delivered or shipped. The Seller reserves the right to reject any warranty claim not promptly reported and any warranty claim on any item that has been altered or shipped through inadequate means of transportation. When any product is returned for examination and inspection, or for any other reason, Purchaser shall be responsible for all damage resulting from improper packing or handling, and for loss in transit, notwithstanding any defect or nonconformity in the product. If it is found that the Seller’s products have been returned without cause, Purchaser will be notified of this circumstance and the product shall be returned at its expenses. In addition, a charge of CHF 200.- for testing and examination (any further claim is reserved based on the time effectively devoted to the activity of examination and testing at an agreed hourly fee of CHF 100.- / hour) shall immediately fall due. Right of withdrawal. Any physical person who is a consumer according to the applicable laws has the right to return the Products, to be exercised within 10 days from delivery, provided that they are unopened, undamaged and sealed. The price shall be reimbursed without delay, deducted any cost, expense, tax, duty, levy or charge referable to the transaction. The Seller warrants that the Products are exempt of defects and compliant with the standard specifications of the Seller in effect on the date of shipment, or to any requirements especially agreed upon with Purchaser, as stated in the confirmation of order, if any. All other warranties, expressed or implied, with respect to the products are waived. Any liability of the Seller out of this contract for any title or circumstance, with the exception of personal injury, shall be limited to intentional wrongdoing or serious fault and to a maximum amount of 5 times the purchase price effectively paid by the Purchaser to the Seller for the quantity of products in respect of which a claim has been made (cap of liability). Under no circumstances shall the Seller be liable for special, incidental, punitive, indirect or consequential damages (including but not limited to loss of profits, revenues, etc.) incurred by the Purchaser or any other person. No liability shall result from delay in performance or non-performance by the Seller caused by serious and unforeseeable circumstances beyond its control, including, without limitation, acts of God, fire, flood, explosions, riots, wars, perils of the sea, labour troubles, machinery breakages, government actions or prohibitions, shortage of raw materials or energy and/or traffic stoppages. Whenever possible, each provision of these Terms and Conditions of Sales shall be interpreted in such a manner as to be effective and valid under the applicable law. The determination by any Court of competent jurisdiction that one or more of the sections or provisions of these Terms and Conditions of Sales are unenforceable shall not invalidate the Terms and Conditions of Sales, and the decision of such Court shall be given effect so as to limit to the extent possible the sections or provisions which are deemed unenforceable. Purchaser shall not assign its rights or delegate its performance hereunder without the prior written consent of the Seller. All contracts shall be construed under and governed by Swiss substantive Law, with the exclusion of the Statute on Private International Law and the United Nations Convention on Contracts for the International Sale of Goods dated as of April 11th, 1980. All disputes between the Seller and Purchaser shall be submitted to the exclusive jurisdiction of the ordinary Courts of Lugano, Switzerland. The Seller shall have the right to bring an action against the Purchaser also before the competent Court of the place where the Purchaser has its domicile / residency or owns assets. Any mandatory rules on jurisdiction as applicable in accordance with international conventions entered into by Switzerland, namely in the field of private consumers’ protection, are fully reserved. 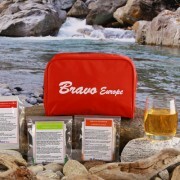 Welcome to www.bravo-europe.com, the information and online-shopping portal of BRAVO (the “Site”). BRAVO is an innovative product based on the skillful blending of enzymes and lactic ferments freely available on the market to yield a quality product capable of fostering the users’ well-being. Contracting party and holder of all righs to the Site is SILVER SPRING Sagl, Mendrisio, Switzerland. Hereinafter you will find the terms and conditons (the “Terms”) governing access to the Site. When he accesses the Site, the user declares that he fully accepts the terms of this agreement. When registering, users will be required to explicitly confirm (by clicking the appropriate box) his acceptance. Notice: BRAVO is not a pharmaceutical, medical or therapeutic product. BRAVO is a complex blend of microorganisms and other ingredients available in the foods market without medical prescription. We do not offer nor provide any medical, diagnostic, prognostic, therapeutic or nutritional counseling. If you need advice in any of these areas please consult your physician. We wish you smooth sailing on www.bravo-europe.com. The Site provides users with services and functionality (the “Services”) free of charge. The Site reserves for itself the right to alter or interrupt the Services as its sees fit and without any advance notice. The user agrees and accepts that within the limits allowed by law the Site is not in any way liable for whatever prejudice he or any third parties may incur due to malfunction of the Site, whether caused by action or omission. If the User is not satisfied with the operation of the Site he is kindly requested to send any comments to info@bravo-europe.com Registration to the Site is open only to persons age 18 and older. By applying for registration the user declares and represents that this condition is met and that his declarations in this respect are truthful. During the course of the user registration procedure the latter is assigned an user name and a password. The user undertakes to use his best efforts in order to protect the confidentiality of the said data. He is solely liable toward the Site for any activity traceable to the use thereof. In the event of unauthorised use of the user name and password assigned to him or of any other security breach that may come to his knowledge, the user undertakes to promptly change his password. The Site claims any and all intellectual property rights regarding the Site, its graphic layout, its databases and the contents produced by it as well as any registered or non-registered trademarks. The user may not alter, copy, publish, reproduce, transmit, divulge, market, create derivative or second-hand works from, visualise or in any way exploit the Services or any content/functionality available on the Site, except for personal use of the Site and of its services, unless prior consent in writing is issued by the owner of the Site. Subject to discretionary revocation at any time, the Site authorises links to the Site’s introductory page (homepage) so long as such links do not harm the Site’s reputation. Conversely, links to the inside pages of the Site (deep links) or the embedding of contents in third-party sites (in-line linking and framing) are prohibited unless prior consent in writing is issued by the owner of the Site. Subject to the guarantee provisions in the General Terms of Sale applicable to the purchase of goods and/or services (link), the user expressly acknowledges that any use of the Services and of the website occurs at his own risk and peril. The Services and the website are provided “as is” and “as available”. Unless otherwise contemplated by law, the Site does not provide any explicit or implied warranty of any kind, inclusive of (but not limited to) any warranty as to merchantability, appropriateness and safety. It does not warrant, in particular, that the Site and its services will satisfy the user’s expectations and/or that the use of the Site’s services will be uninterrupted, prompt, safe and error-free. The Site does not guarantee the accuracy, truthfulness and/or reliability of any information and/or communications published on/conveyed by the Site and/or originating from the services connected with it, nor does it guarantee that any defects – although posted – will be corrected. The User bears the risk of accessing, using and navigating on www.bravo-europe.com. The User acknowledges and accepts the fact that the Site, as well as any and all individuals, entities and companies connected with its activity, refuses any liability for damage of any kind (in particular: direct and indirect damage, damage to reputation, loss of profit, etc.) the user may incur by accessing and using the Site. The Site may at any time curtail or discontinue, without prior notice and in its full discretion, the availability/usability of the Site and Services. The user shall be owed no indemnification in the event that the Site avails itself of such right. a) The user undertakes not to use the Site and/or its Services in a manner that is illegal, immoral or harmful to third-party rights. d) The user undertakes not to convey material that encourages behaviour which may constitute criminal conduct, cause civil liability or infringe Swiss and/or foreign laws. e) The user undertakes not to use the Site and/or its Services for the purpose of committing acts that are illicit, fraudolent or injurious to the rights of third parties, inclusive of the right to privacy and other rights related to image, name and honor. f) Any actual or attempted unauthorised access to the Site’s electronic data processing system is prohibited. Any transactions – especially in terms of the supply of goods and/or services (with regard to terms, warranties, representations etc.) − between users and third-party advertisers and/or business partners etc. of the Site affect solely the user(s) and such third parties. The Site provides no guarantee with regard to the operation of third parties nor does it accept liability for any damage resulting from transaction with any such third parties. The Site reserves for itself the right, in its own discretion, to decide whether the user’s conduct is consistent with the letter and spirit of these Terms. The Site reserves for itself the right to suspend, limit or terminate the user’s registration as well as to wholly or partially bar the user from accessing/using the Site and/or the Services, particularly if the user’s conduct is deemed to be not consistent with these Terms. Welcome on www.bravo-europe.com, the information and shopping portal of BRAVO (the “Site”). BRAVO is an innovative product based on the skillful blending of enzymes and lactic ferments freely available on the market, yielding a quality product capable of fostering the user’s well-being. The capability of providing certain services requested by the user (e.g. processing, sharing and receiving contents, receiving newsletters and other informational communications, making discussion forums available, etc. ), the very nature of the internet as an “open” network as well as the web’s technical properties (client-server infrastructure) necessarily imply the gathering and processing of certain kinds of data by the Site, including personal data regarding the user (e.g. the IP address assigned to the device employed by the user while navigating the internet, the unequivocal identifiers of mobile devices, etc.) By using the Site the user declares his full and unconditional acceptance of the terms of this Policy, particularly as they refer to the treatment of personal data, described or inferred by the Policy itself, by the Site. If the user does not intend to accept the Policy he must immediately stop using the Site. The Site reserves for itself the right to change the Policy at any time and in its own discretion. In particular, the Policy is constantly updated to reflect the evolution of the Federal Act on the Protection of Personal Data (“FAPD”). It is incumbent upon the user, as he enters the Site, to check the status of the Policy. Notice of any changes to the Policy and of their effective date is given either on the Site or by personal (e-mail) communication at least 7 days in advance. Once it takes effect the new Policy will automatically be binding for all users. Accessing the Site after the new Policy has taken effect implies the users’ acceptance of any such changes. Our policy concerning the protection of personal information is described below. We wish you enjoyable surfing on www.bravo-europe.com. The Site may process personal information only in strict compliance with this Policy and/or with applicable statutes (chiefly the FADP). Personal information means any and all information concerning the user not in the public domain, to the extent that the user is identified or identifiable (“personal information”). In particular, data disclosed and/or made available by the user to the world is public-domain non-protected information insofar as the user has not expressly objected to its being processed. The Site processes the following information/data supplied by the user at the time of registration: a) non-optional data: name and surname/company, full address, telephone number, e-mail address; b) optional data: occupation, fax number, credit card data, PayPal info. The Site does not collect personal data worthy of special protection pursuant to Art. 3.c FADP, such as race, ethnic origin, religion or health status. The Site does not gather or process personal user data unless necessary to allow access to, use of and/or improvement to the Site, subject to these provisions. Subject to the following, the Site neither processes nor transmits advertising messages predicated upon the online behavior of users; it does not record the users’ online activity nor support the use of tools aimed at monitoring the use of web resources or e-mail. The Site indicates the purposes for which personal information is gathered or processed – if circumstances do not make them obvious – no later than when such information is gathered. The purposes may be indicated either via the browser or by individual or general notice, or they may refer to this Policy. Personal information may be processed only within the framework of the purpose indicated or derived from the circumstances at the time of gathering. Thus, if a user sends an e-mail containing a question or a comment, the Site may use his e-mail address to reply to it. The Site may durably store and archive such e-mail, the e-mail address and a copy of the reply. The Site is authorised to gather and process user-supplied information in order to provide the user with special services such as newsletters and/or to suggest online activities and events – notably of cultural or educational nature – related to the activity of the Site. Within the framework of its activity the Site uses external suppliers of goods and services (Cloud Computing, IT services, hosting e housing services, legal services, etc.). The Site provides such suppliers with access to personal information to the extent such access is useful or necessary for the proper and efficient performance of their tasks. The transmission of and access to such personal information is subject to the proviso that such third parties, as well as the data, are operating or located in Switzerland and have signed a commitment to keep such information confidential and to not use them for reasons unrelated to the performance of their tasks. The Site shall not be liable for the actions of such third parties so long as no serious negligence emerges in terms of the selection, training and supervision of such third parties. The Site is authorised to convey personal information to third parties – affiliates/sponsors/marketing partners/advertisers – for marketing purposes only upon the express and informed consent of the user (“opting in”), in order to make it possible for the user to receive promotional offers, notices of events and customised advertisements from such third parties directly. Conversely, the Site is authorised as of now to provide users, at the personal addresses supplied when registering, with information regarding the activity of the Site and messages of business partners, sponsors and advertisers, even with advertising content. The Site is not liable for the actions of such third parties; this applies particularly to the contents of such communications and to the proper fulfillment of any agreements entered into with the user. But if the user shuts out cookies he may experience a somewhat reduced Site functionality. The Site uses Google Analytics. Thanks to a cookie of its own, Google Analytics anonymously detects the Site users’ navigation information and trends and saves and processes data such as the IP address, the time of the visit to the Site, what pages were viewed, time expended for each page, what connections were activated, whether the visit was the user’s first and the like, in addition to information on the origin of traffic to the Site. Information generated by the cookies are routed to a Google server in the United States and archived there. Google may potentially transfer such information to third parties if required by law or in the event that third parties are processing such data for the account of Google. Google has promised to comply with data protection provisions under the US-Swiss Safe Harbor agreement. If you wish to disable Google Analytics, the necessary browser add-on can be downloaded from this link. For further information on ads and on data protection in Google, click this link. Unless otherwise provided by this Policy or by law, the Site undertakes not to sell, lease, lend, trade or transfer personal information (inclusive of e-mail addresses) to or with third parties and to treat any such information as confidential. The Site conveys user-related personal information to third parties only if authorised by law, by the Policy or upon the prior consent of the concerned party and provided the addressee has its head office of record/his residence in Switzerland or in a country that protects personal data in a manner consistent with the lists drawn up by the Federal Official in Charge of Data Protection matters, unless such conveyance is requested or authorised by law or is ordered/authorised by a Swiss judicial or administrative authority. The Site stores personal information relating to users for as long as such data serves the purpose for which it has been gathered or such storage is required by statute. Within the limits of the law, if the registered user cancels his account all personal information contained therein or to which it may refer will be automatically deleted except for any written or electronic correspondence between the parties. By supplying personal information and/or using the Site the user accepts that such personal information is gathered and processed pursuant to law and/or this Policy. Depending on circumstances or on the sensitivity of the data supplied by him or processed, the user may be asked to expressly declare his consent to the gathering and processing of personal information. Such consent may be revoked by the user at any time by so advising the Site in the manner indicated in Section I below. The Site is authorised to gather, use and convey personal information relating to users without obtaining their prior consent if such gathering, use and conveyance is permitted or required by law or in the presence of an order issued by a Swiss judicial or administrative authority. Only authorised persons have access to personal user data within the limits of what is strictly necessary for them to perform their tasks. The Site implements all reasonable and proportionate security measures against unauthorised access, use, conveyance, alteration, loss or destruction of personal user data. These measures are of a technical, physical and organisational nature. However, since the internet is an open network, the Site cannot and does not guarantee an absolute level of protection. Accordingly, the Site rejects any liability in this connection so long as the damaging event is not the direct consequence of willful or grievously negligent action attributable to the Site. Also, the Site is not in a position to guarantee the confidentiality of data supplied or conveyed via the website or by e-mail. Hence, the Site rejects any liability regarding the security of data in transit via the internet from/to the Site in the manner indicated above. The Site acknowledges the right of every user to access his own personal information free of charge and to verify the accuracy thereof as well as to cause it to be changed, corrected or updated. Upon request, the user has the right to be told whether and in what manner personal information concerning himself is being processed. In some specific instances – if the law so provides – access to data may be denied. The Site will positively evaluate any user suggestion or complaint regarding its policy on privacy and personal data protection. The Site is owned by SILVER SPRING Sagl, Mendrisio, Switzerland. The internal person in charge of data protection may be contacted at the e-mail address indicated in the following Section I. If you have any comments and/or questions relating to our Policy and the handling of your personal data, please contact info@bravo-europe.com .